The Contours Option Elite Tandem Double Stroller is a good stroller for getting around town and in tight places. This is the stroller you want if maneuvering around malls, clothing aisles, and crowded places. The Contours Option Elite Tandem Double Stroller is nice because it will fit between a standard sized doorway. The side by side strollers may push a bit easier than the tandems, but they are also much bulkier and simply can't get through tight places. If you've ever had to wake a sleeping child just to get through a doorway, you will appreciate a tandem stroller like the Contours Option Elite Tandem Double Stroller. Keep in minding that this is not a running stroller. But it may meet your needs if walking on smooth surfaces is where you'll be traveling most with your little ones. Let's take a closer look at this stroller and see what people have to say about it. 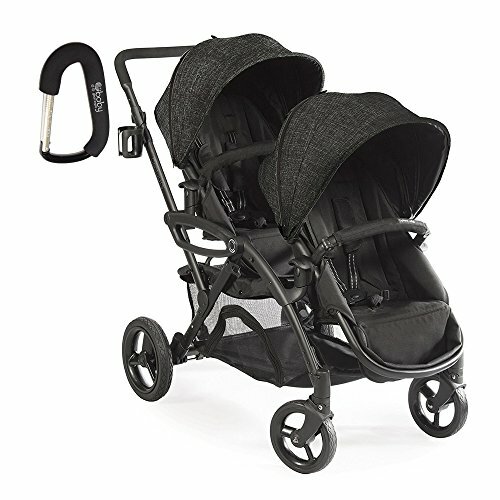 The Contours Option Elite Tandem Double Stroller has been changed from the material that it used to be made from, and consequently, the weight load changed. It used to be made with a heavier bar metal, but now, the frame is made from aluminum so the weight load has been decreased to 40 pounds per child seat. That means that it will hold 80 pounds total. A positive change for the Contours Option Elite Tandem Double Stroller, is that the change in metal decreased the stroller weight down to 34 pounds. This is nice because you won't be pushing as much equipment around. Some strollers can really weigh you down Before you even add your children. Reduced weight on any stroller is a good thing. Whether or not a double stroller can accommodate an infant stroller is a hot topic among parents. The good news is that the Contours Option Elite Tandem Double Stroller can not only just accommodate one infant car seat, it can fit two infant car seats. The car seats will obviously add more weight to your stroller, but some parents love this option. This feature is really nice for parents of twins. When you have kids the exact same age, they are going to need to grow with the stroller. The Contours Option Elite Tandem Double Stroller will accommodate your children's seating needs from the infant to toddler stage. This stroller uses the stadium style seating arrangement. This means that the child in the back is elevated and can see out better without having his or her view blocked by the child in the front. Both seats have a 5 point safety harness. This feature appears to be standard in all of the strollers I've been reviewing. It's a nice safety feature so that children can't hang out and lean forward like kids could do in the strollers of long ago. The seats are reversible in the Contours Option Elite Tandem Double Stroller with new lift-assist mounts that allow for 7 seating options. This stroller has both front and rear wheel suspension. The total number of wheels is 4 with the back wheels being slightly larger in diameter from the front wheels. From looking at the stroller, you can see that the canopies operate separately from each other. This is a feature in tandem strollers that many parents appreciate. If one child wants a canopy down and one wants one up, then this stroller can accommodate both tastes and needs. Often when one child is sleeping, it's nice to give that child full shade. If the other child is awake, you have the option of having the canopy up or down. Both canopies have peek-a-boo windows. This allows the parent to peek down at both children without having to stop the stroller to check on them. Some kids like to look back up at their parents through the window. It's a nice feature to have. Maneuverability is a divided topic among parents who bought this stroller. Some said they got around great in this stroller, while others said it was very hard to turn. Keep in mind that this is not a performance stroller made for running. For what you are getting in this double tandem stroller, the price is right about in the middle of the road compared to other similar models. The Contours Option Elite Tandem Double Stroller has been upgraded to now include a sandal friendly brake pedal. There is not a hand held brake on this stroller, which can be a problem when you are trying to control the stroller down a hill. This stroller utilizes a bar instead of two handles. It's a personal preference of whether you prefer one long bar or two handles. A negative that I read from taller parents was that the bar was a bit low for taller people. The product description says that this stroller folds down easy for storage. This topic though had a wide range of comments from parents. Some said that for a double it folded down nice and compact, while many other comments said it was super large and hard to fold down and transport. It really came down to how big your vehicle storage space was. If you have a compact car with a small trunk, you are going to have a hard time if not impossible time getting this stroller in. This is a common complaint of most double wide strollers because they are simply bigger and bulkier than single wide strollers. The storage on the Contours Option Elite Tandem Double Stroller is excellent. The whole basket under the seats can fit a lot of baby stuff in it. It's one of the largest storage areas I've seen in a double stroller from the strollers that I've reviewed. If you want to get around tight areas like shopping centers and trips to Disney Land, than this stroller may just be it for your and your two little passengers. It has 7 different seating options and is priced in the mid-range for a stroller of this type. The storage area under the seats is very large which makes it great for day trips. To see our full review of the top ten double strollers of 2018, check out our article here.